Steve Jobs is the authorized self-titled biography book of Steve Jobs. The book was written at the request of Jobs by Walter Isaacson, a former executive at CNN and TIME who has written best-selling biographies of Benjamin Franklin and Albert Einstein. Based on more than forty interviews with Jobs conducted over two years—in addition to interviews with more than one hundred family members, friends, adversaries, competitors, and colleagues—Isaacson was given "unprecedented" access to Jobs's life. Jobs is said to have encouraged the people interviewed to speak honestly. Although Jobs cooperated with the book, he asked for no control over its content other than the book's cover, and waived the right to read it before it was published. The book was released on October 24, 2011, by Simon & Schuster in the United States, 19 days after Jobs' death. A film adaptation written by Aaron Sorkin and directed by Danny Boyle, with Michael Fassbender starring in the title role, was released on October 9, 2015. The book's cover photograph is similar to one taken previously by Norman Seeff and featured on Rolling Stone. The front cover uses a photo of Steve Jobs commissioned by Fortune magazine in 2006 for a portfolio of powerful people. The photograph was taken by Albert Watson. When the photograph was taken, he said he insisted on having a three-hour period to set up his equipment, adding that he wanted to make "[every shoot] as greased lightning fast as possible for the [subject]." When Jobs arrived he didn't immediately look at Watson, but instead at the equipment, focusing on Watson's 4×5 camera before saying, "wow, you're shooting film." If you look at that shot, you can see the intensity. It was my intention that by looking at him, that you knew this guy was smart. I heard later that it was his favorite photograph of all time. Jobs gave Watson an hour—longer than he had given most photographers for a portrait session. Watson reportedly instructed Jobs to make "95 percent, almost 100 percent of eye contact with the camera," and to "think about the next project you have on the table," in addition to thinking about instances when people have challenged him. The title font is Helvetica. The back cover uses another photographic portrait of Jobs taken in his living room in Woodside, California in February 1984 by Norman Seeff. In a Behind the Cover article published by TIME magazine, Seeff recalls him and Jobs "just sitting" on his living room floor, talking about "creativity and everyday stuff," when Jobs left the room and returned with a Macintosh 128K (the original Macintosh computer). Jobs "[plopped] down" in the lotus position holding the computer in his lap when Seeff took the photograph. We did do a few more shots later on, and he even did a few yoga poses—he lifted his leg and put it over his shoulder—and I just thought we were two guys hanging out, chatting away, and enjoying the relationship. It wasn't like there was a conceptualization here—this was completely off the cuff, spontaneity that we never thought would become an iconic image. The placeholder cover used for the book uses the working title, iSteve: The Book of Jobs. The book's working title, iSteve: The Book of Jobs, was chosen by publisher Simon & Schuster's publicity department. Although author Walter Isaacson was "never quite sure about it", his wife and daughter reportedly were. However, they thought it was "too cutesy" and as a result Isaacson persuaded the publisher to change the title to something "simpler and more elegant." The title Steve Jobs was allegedly chosen to reflect Jobs's "minimalist" style and to emphasize the biography's authenticity, further differentiating it from unauthorized publications, such as iCon Steve Jobs: The Greatest Second Act in the History of Business by Jeffrey Young. Many of the chapters within the book have sub-headings, which are matched in various audiobook versions resulting in listings showing 150+ chapters when there are only 42 chapters. The audiobook contains a mistake on one chapter title, listing Chapter 41 as "Round Three, A Never-ending Struggle" instead of "Round Three, Twilight Struggle" as published. Steve Jobs is a drama film based on the life of Apple co-founder Steve Jobs, starring Michael Fassbender in the title role. The film is directed by Danny Boyle, produced by Scott Rudin, and written by Aaron Sorkin (with a screenplay adapted both from Isaacson's Steve Jobs as well as from interviews conducted by Sorkin). Extracts from the biography have been the feature of various magazines, in addition to interviews with the author, Walter Isaacson. To memorialize Jobs's life after his death on October 5, 2011, TIME published a commemorative issue on October 8, 2011. The issue's cover featured a portrait of Jobs, taken by Norman Seeff, in which he is sitting in the lotus position holding the original Macintosh computer. The portrait was published in Rolling Stone in January 1984 and is featured on the back cover of Steve Jobs. The issue marked the eighth time Jobs has been featured on the cover of Time. The issue included a photographic essay by Diana Walker, a retrospective on Apple by Harry McCracken and Lev Grossman, and a six-page essay by Walter Isaacson. Isaacson's essay served as a preview of Steve Jobs and described Jobs pitching the book to him. Bloomberg Businessweek also released a commemorative issue of its magazine remembering the life of Jobs. The cover of the magazine features Apple-like simplicity, with a black-and-white, up-close photo of Jobs and his years of birth and death. In tribute to Jobs's minimalist style, the issue was published without advertisements. It featured extensive essays by Steve Jurvetson, John Sculley, Sean Wisely, William Gibson, and Walter Isaacson. Similarly to Time's commemorative issue, Isaacson's essay served as a preview of Steve Jobs. Fortune featured an exclusive extract of the biography on October 24, 2011, focusing on the "friend-enemy" relationship Jobs had with Bill Gates. Even after a late release that year, the book became Amazon's #1 seller for 2011. ^ Yin, Sara (August 15, 2011). "Tell-All Steve Jobs Biography Hits Stores on November 21". PC Magazine. Retrieved October 6, 2011. ^ Gilbert, Jason (August 25, 2011). 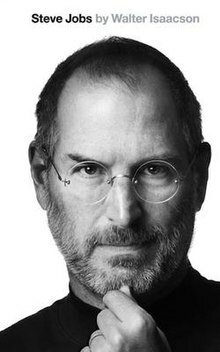 "Steve Jobs Biography Gets Cover, November Release Date". The Huffington Post. Retrieved October 6, 2011. ^ Elmer-DeWitt, Philip (August 16, 2011). "A peek at Steve Jobs' book jacket – front, back and spine". Fortune. CNN Money. Archived from the original on October 16, 2011. Retrieved October 20, 2011. ^ Olivarez-Giles, Nathan (August 15, 2011). "'Steve Jobs: A Biography' release date is moved up to Nov. 21". Los Angeles Times. Retrieved October 6, 2011. ^ Ong, Josh (August 15, 2011). "Biography of Apple CEO Steve Jobs to arrive in November". AppleInsider. Retrieved October 6, 2011. ^ "The Steve Jobs Nobody Knew". Rolling Stone. Wenner Media. October 12, 2011. Retrieved October 20, 2011. ^ a b c Walker, David (October 6, 2011). "Steve Jobs: Visionary, Inventor, and Very Challenging Photo Subject". Photo District News. Nielsen. Retrieved October 3, 2015. ^ Ong, Josh (August 15, 2011). "Biography of Apple CEO Steve Jobs to arrive in November". AppleInsider. Retrieved October 16, 2011. ^ a b Seeff, Norman (October 6, 2011). "Behind the Cover: Steve Jobs". TIME. TIME. Retrieved October 20, 2011. ^ Elmer-DeWitt, Philip (July 5, 2011). "Steve Jobs' bio gets a new title". Fortune. CNN Money. Retrieved October 20, 2011. ^ Schramm, Mike (July 5, 2011). "Steve Jobs biography gets new title: 'Steve Jobs'". TUAW. AOL. ^ Weintraub, Seth (October 19, 2011). "Steve Jobs Biographer to be on 60 Minutes Sunday". 9 to 5 Mac. 925. Retrieved October 20, 2011. ^ "TIME's Steve Jobs Covers". TIME. April 2, 2010. Retrieved October 16, 2011. ^ Elmer-DeWitt, Philip (October 6, 2011). "The day Steve Jobs called Walter Isaacson". Fortune. CNN Money. Retrieved October 16, 2011. ^ Weintraub, Seth (October 20, 2011). "Fortune will have exclusive excerpt of Steve Jobs bio Monday focusing on relationship with Bill Gates". 9 to 5 Mac. 925. Retrieved October 20, 2011. ^ Marsal, Katie. "Steve Jobs biography is Amazon's best selling book of 2011". Apple Insider. Apple Insider. Retrieved November 10, 2014. ^ Andrew Hill. "Biographies and economics dominate". Financial Times. Retrieved September 15, 2012.